Bulwark® is the leading provider of secondary flame-resistant apparel in the world. 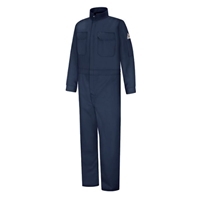 Bulwark garments offer superior flame-resistant protection, comfort, and durability to thousands of workers in electrical utilities and the chemical, oil, gas, mining and petrochemical industries. Bulwark has a 43-year heritage of technical innovation and industry leadership, always remembering that wearer safety is the primary concern. The Bulwark brand makes up the industry’s most comprehensive flame-resistant product line in the broadest range of proven thermal protective fabrics. Bulwark CLC8NV 3XL Long is a non-stock (special cut) item from Bulwark. Please allow 6-8 weeks before shipping.